1. Over the last years, Iran has visibly improved its air defense (AD) systems by phasing in modern indigenous surface-to-air missile (SAM) systems. The Iranian SAM deployments primarily safeguard the regime as well as the nuclear and ballistic missiles (BM) programs. The protection of major population centers represents a secondary concern. Given the escalating tensions with Israel, the United States and the Gulf states, Iran will likely increase the readiness of its AD in the immediate future. 2. The responsibility for the Iranian AD is shared between the Khatham al-Anbia Air Defense Base of the regular Iranian Armed Forces (Artesh) and the Iranian Revolutionary Guards Corps Aerospace Forces (IRGC-AF). The rivalry between Artesh and IRGC, alongside shortfalls in C4 infrastructure, prevents Iran from developing a truly integrated AD system. 3. Iran’s AD doctrine recognizes the asymmetric superiority of adversarial striking capabilities. The Artesh and IRGC-AF therefore deploy a minimal AD regime, which aims at SAM survivability on the first day of war, and seek alternative AD measures. The alternative tactics focus on detecting, jamming and intercepting hostile targets through passive aerial detection radars, electronic warfare means and air assets tasked with countering enemy ordinance. 4. In the medium to long term, the introduction of new, indigenously produced SAMs and radars will shift the Iranian AD doctrine back towards traditional assets. The growing availability of modern and domestically sustainable systems will allow Iran to gradually decommission outdated SAMs or provide combined saturated coverage over key areas. 5. The indigenous SAMs show both original features and marks of reverse engineering from Russian, Chinese and U.S. systems. Their effectiveness is difficult to assess due to operations security and lack of combat testing. 6. The limited SAM inventory and the large Iranian territory mandate an austere deployment regime. Only Tehran and central Iran are comprehensively covered due to the presence of nuclear/BM sites and governmental institutions. Southern, western and northern Iran are partially sealed, while the eastern part of the country is almost entirely uncovered. 7. The Iranian geography significantly interferes with AD radar coverage. As 60 percent of Iran’s terrain has an elevation of over 1,800 meters, low-altitude radars are blocked in large segments. The Zagros-Alborz mountain ring (2000-5000 m elevation) in particular obstructs aerial detection radars based on the central Iranian plateau. Despite its geographical challenges, Iran has made little progress in procuring or modernizing aircraft (airborne early warning and control systems/AWACS) that could alleviate these blind spots. 8. We estimate that open-source IMINT findings account for approximately 40 to 50 percent of operational Iranian SAMs, including those garrisoned. 9. The capital is Iran’s best defended area. 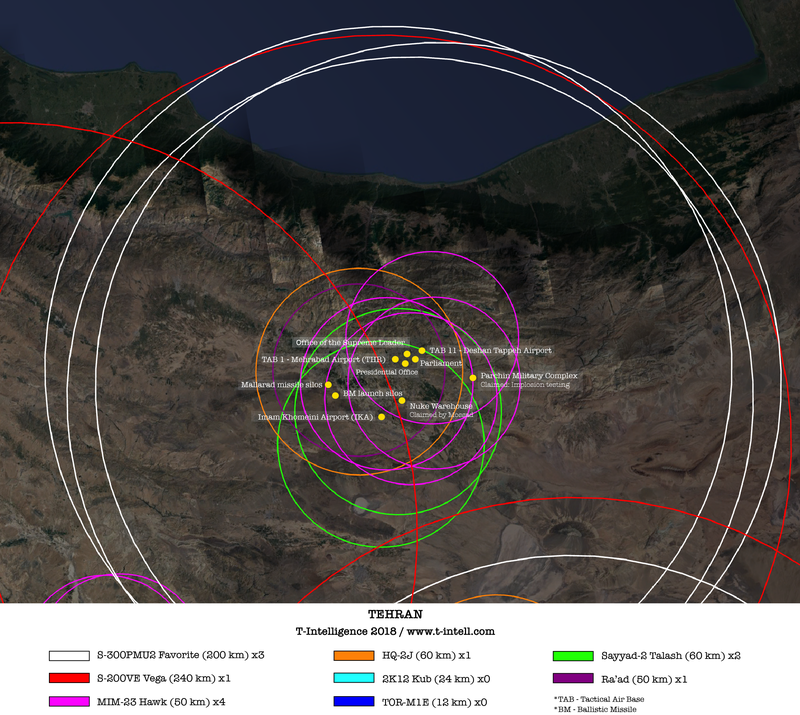 Tehran’s AD network protects various nuclear and BM locations, including research and development facilities, storage sites and launch silos. Iran’s political bodies, military command centers and major bases are also located in the capital. 10. Tehran’s Area Air Defense (AAD) is formed by three layers of long-range SAMs: Two S-300PMU2 Favorites and one S-200VE Vega. The S-300PMU2s specialize in tracking small radar-cross section (RCS) objects such as cruise missiles, fighter jets and small-range ballistic missiles. The S-200 Vega is proficient at longer-ranges and higher-altitudes, but reliable only against large RCS objects such as AWACS, electronic intelligence (ELINT) and intelligence, surveillance & reconnaissance (ISR) platforms, and heavy lifters. 11. An abundance of legacy and newly produced short-/medium-range systems provide saturated Point Air Defense (PAD). Four legacy MIM-23 Hawks and one HQ-2 (Chinese version of the S-75) with minimal domestic upgrades form the weaker links in the PAD chain. 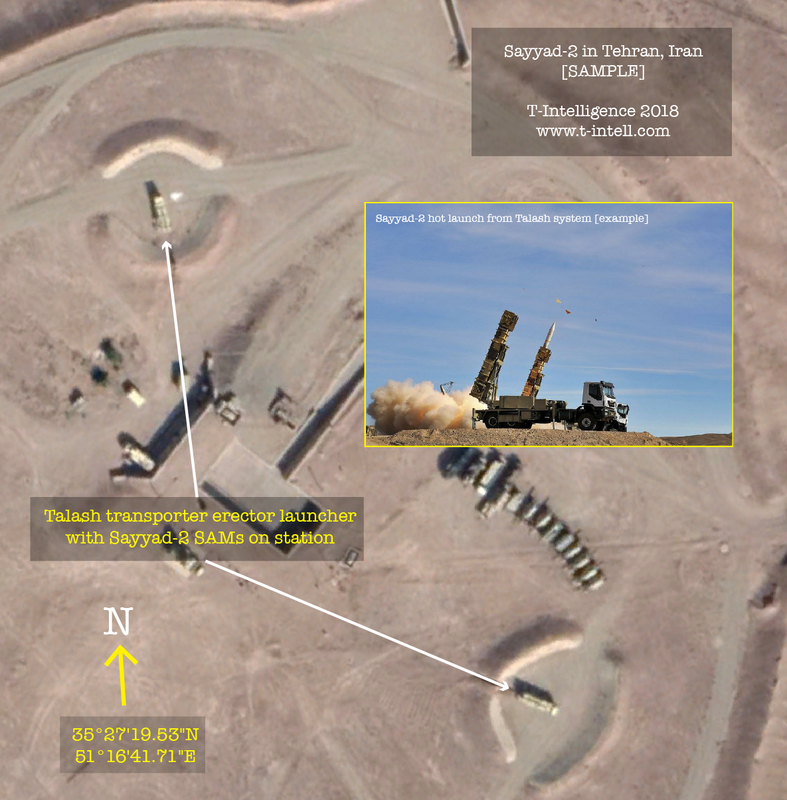 Two indigenous Talash systems, armed with Sayyad-2 missiles (“Hunter-2” in Farsi), and one Ra’ad system (Buk imitation) strengthen Teheran’s PAD capabilities. 12. Iran has invested massively to make the Sayyad the jack-of-all-trades missile for its indigenous SAM systems. The Sayyad-2 medium-range SAMs are versatile, cross-platform compatible, and domestically produced. The missiles are based on the U.S. RIM-66 naval SAM and can be fired from the Talash, the S-200, and other launchers. The long-range Sayyad 3 and the forthcoming Sayyad 4, which are based on the S-300’s 48N6E/2 SAM, will arm Iran’s Bavar 373 system. 13. SAM coverage in the Iranian Heartland (Isfahan province) is multi-layered and saturated. The AD bubbles protect some of Iran’s major population centers such as Qom, Isfahan and Natanz. The area also hosts key nuclear and BM sites, including an uranium production facility near Natanz as well as a uranium conversion center and BM-launch silos near Isfahan. An extensive network of bunkers traverses the hills and mountains around the two cities. 14. Isfahan’s AAD double-layer consists of one S-300PMU2 and one S-200VE system, based close to Isfahan International Airport. Three MIM-23 Hawks and one Sayyad-2 capable Talash system provide PAD. 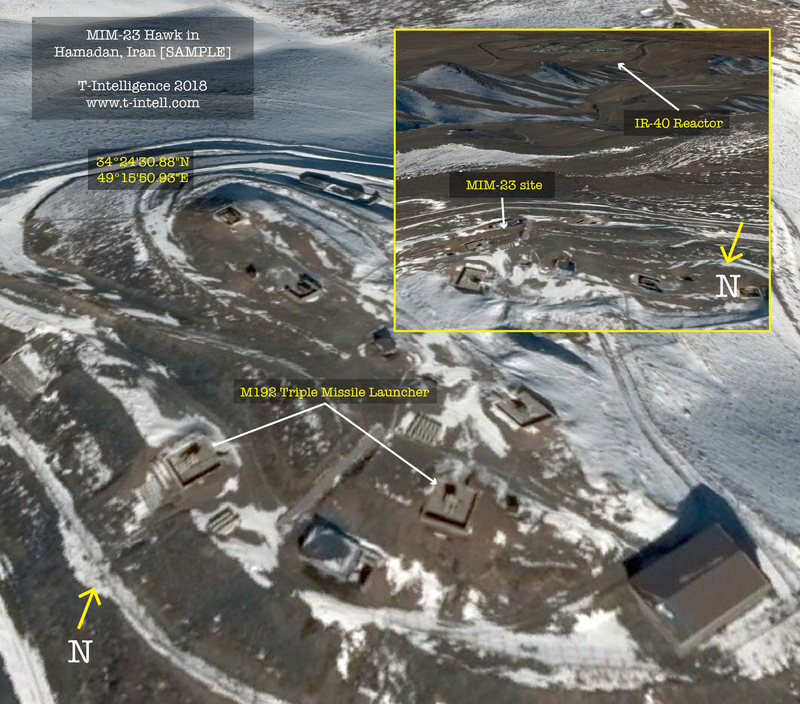 The PAD assets are scattered to create overlapping coverage for the long-range SAMs and nuclear/BM sites. 15. The Natanz area is covered by the long-range SAMs based in Isfahan and Tehran. The area hosts only mid-, short- and very-short-range assets with limited engagement envelopes, which suggests a focus on countering saturation missile attacks. Two HQ-2s, two 2K12 Kub and three Tor-M1E form the local AD bubble. The highly mobile Kub and Tor can be scattered easily and used for shoot-and-scoot tactics. We have identified at least 12 empty AD sites in the area that could host indigenous SAMs in the future. 16. The Southern Seaboard has a modest SAM coverage, which is currently transitioning to newer assets. 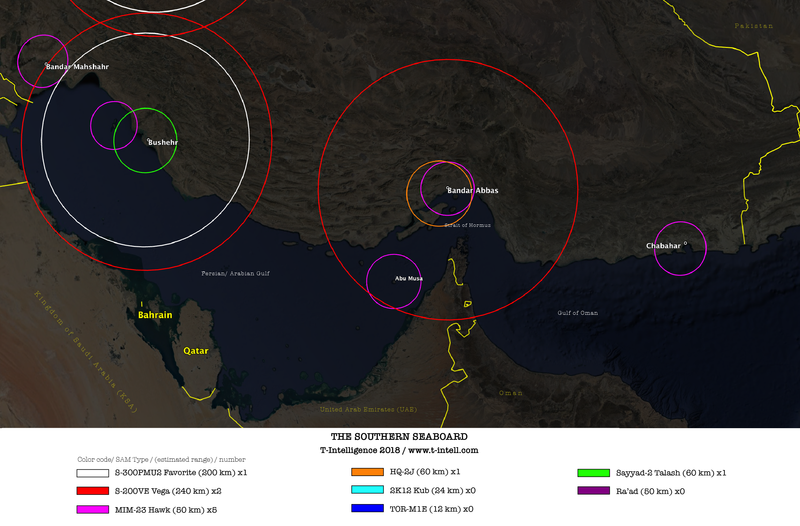 The PAD-exclusive extremities and the SAM-free gap between Bushehr and Bandar Abbas are among the most vulnerable sections of the Iranian airspace. 17. The Southern Seaboard is a strategically vital region due to the proximity of adversarial territories and international trade routes. 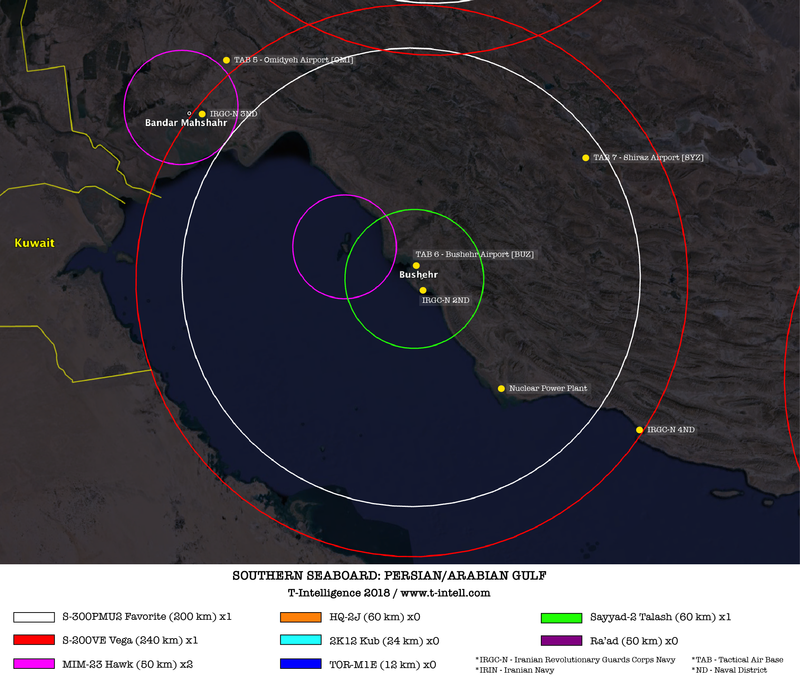 Iranian SAMs are deployed to secure the southern airspace and to monitor the Persian/Arabian Gulf and the Strait of Hormuz. 18. The IRGC Navy (IRGC-N) is responsible for the Gulf, while the regular Iranian Navy (IRIN) is tasked with protecting the Sea of Oman and the Indian Ocean. The operational headquarters and nearly 90 percent of IRGC-N/IRIN bases are located on the Southern Seaboard (Khuzestan, Bushehr, Hormozgan and Baluchestan provinces). Tactical air bases (TABs), vital oilfields, and a nuclear power plant are also situated near the coast. 19. The Persian/Arabian Gulf is the only part of the Southern Seaboard that is adequately covered. Bushehr hosts a double long-range AAD layer. 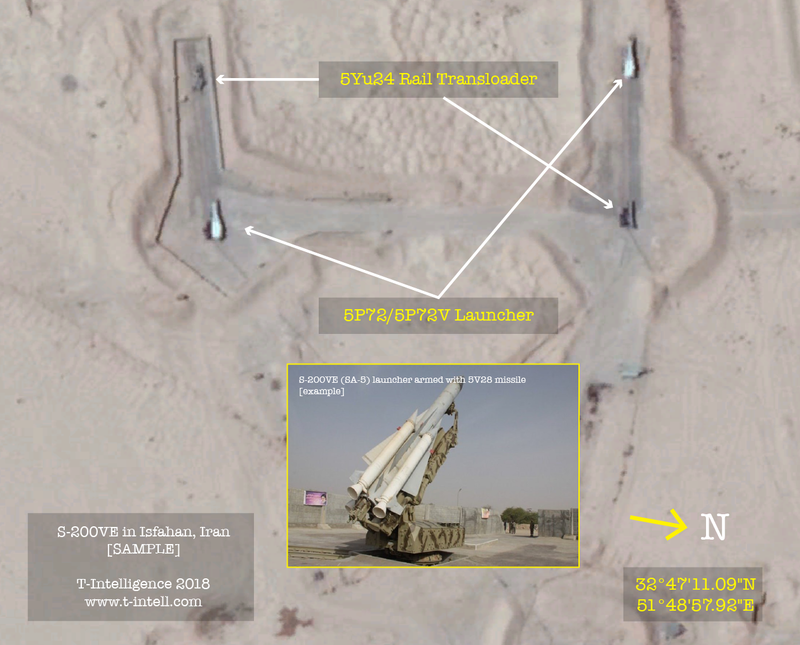 One rail-based S-200 Vega and one new S-300PMU2 (replacing a MIM-23 retired in May 2017), are positioned on the grounds of TAB 6 (Bushehr International Airport). 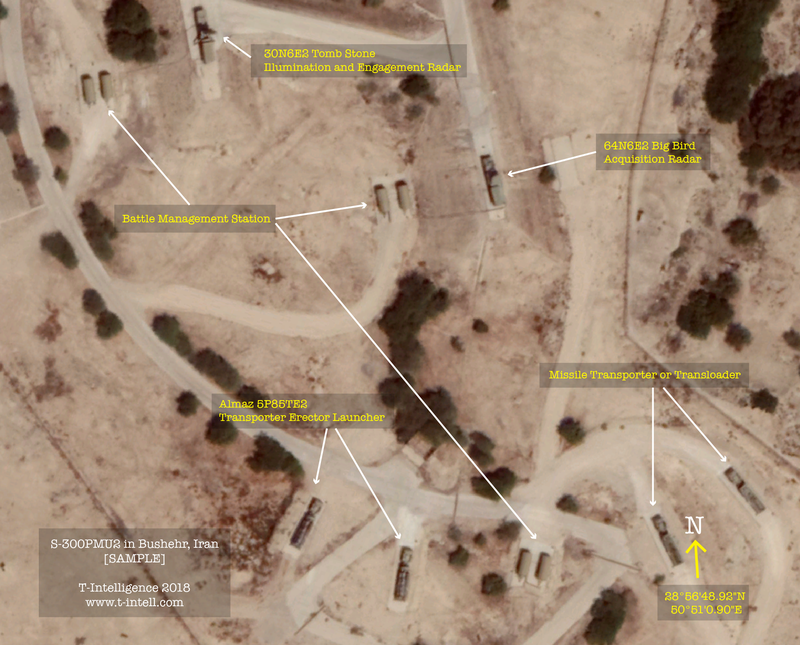 S-300PMU2 site near Bushehr International Airport, Iran. The SAM system replaced a decommissioned Hawk-23 MIM in May 2017. CORRECTION: The S300’s radars have been mislabeled. The engagement radar is actually the 96L6 “Cheeseboard,” while the acquisition radar is the 306N3 “Flap Lid” (as pointed out by Twitter user @border9999). 20. An outdated Hawk MIM-23 and a Talash system armed with Sayyad-2 missiles provide the PAD for the area. Besides naval bases, the saturated SAM deployments guard the Bushehr Nuclear Power Plant, which would likely figure high on adversaries’ target lists. 21. 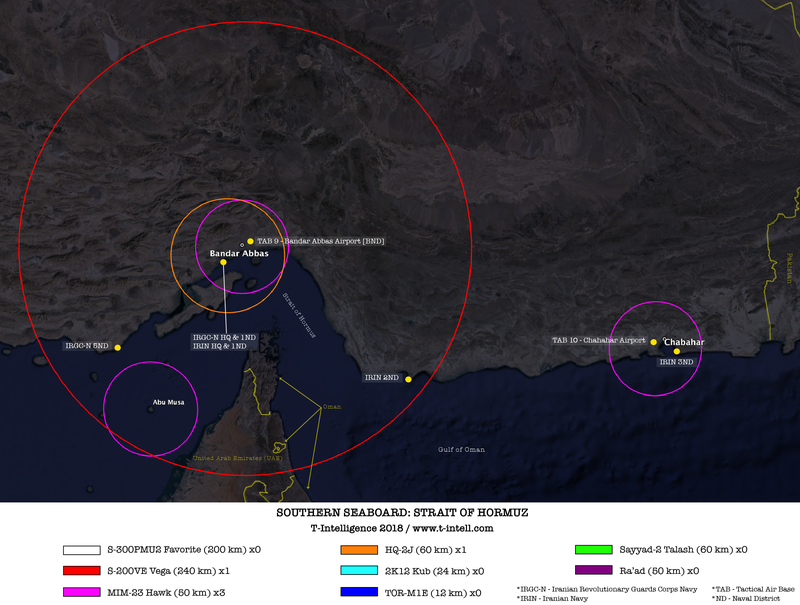 The Bushehr-based S-200 Vega also provides partial, but unreliable coverage (range edge) for Bandar Mahshahr. This renders the Mahshahr area open to air attack, as it has only one local PAD site (MIM-23 Hawk). However, at least three empty AD sites stand ready to host further SAM systems. 22. The Strait of Hormuz is moderately exposed. The S-200VE deployed in Bandar Abbas leaves the area vulnerable to advanced fighter jets, low-observable cruise missiles and unmanned aerial vehicles (UAV). The PAD layer consists of one Hawk MIM-23 and one Chinese HQ-2. While these systems focus on the low-altitude blindspot of the S-200, they are largely impotent in the face of maneuvering targets and powerful jamming. 23. Abu Musa Island serves as a forward early warning post and staging point for special operations forces. Despite its strategic position near international shipping lines, the island lacks major military installations. The local MIM-23 Hawk site is a folder cannon, aimed at increasing the survivability of more important assets such as radars and missiles launchers on the mainland. An unknown number of naval SAMs carried by IRGC-N vessels provide additional AD in the Strait of Hormuz. The IRGC-N is scheduled to receive the latest naval version of the Sayyad in the near future. 24. A recently deployed MIM-23 Hawk in Chabahar is the only SAM system on the coast of the Gulf of Oman. As Chabahar is undergoing multi-billion-dollar investment and is on route to become Iran’s key deep-water port, the city will likely be one of the first recipients of the Sayyad 3 or 4 SAMs. The area hosts two major IRGC-N/IRIN bases and serves as a gateway to both the Strait of Hormuz and the eastern Iranian airspace. 25. Iran’s western flank is poorly defended, even though the region, which hosts several TABs and nuclear/BM facilities, is in the immediate proximity of the U.S. military bases in Iraq and Kuwait. 26. An S-200VE based in TAB 3 (Hamdan Airport) provides AAD over Hamadan, Kermanshah and Kurdistan provinces. 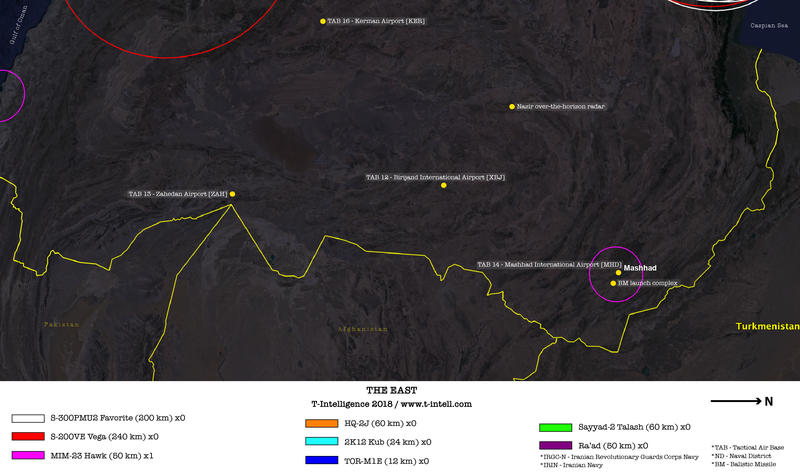 Iran’s long-range Fa’ath 14 radar near TAB3 is within coverage, but lacks a PAD layer. The IR-40 nuclear reactor and the uranium enrichment facility near Arak are guarded by an AAD overlay of the Hamadan- and Tehran-based S-200 SAM systems. Two MIM-23 Hawks, stationed in the vicinity of the nuclear sites, provide an additional, yet limited layer of PAD. 27. The Tabriz area in the Northwest completely lacks long-range SAM coverage. Critical military locations depend on one MIM-23 Hawk and one 2K12 Kub for PAD. The patchy AD coverage is puzzling, given the unique geo-strategic position of northwestern Iran. The underground BM launch complex near Tabriz potentially brings parts of Europe within striking range for Iranian Shahab missiles. 28. The southwestern airspace is even more vulnerable. The only SAM deployment in the area, a MIM-23 Hawk, is located on the ground of TAB 4 (Dezful Airport). Several empty AD revetments are scattered throughout the region. 29. Iran’s eastern airspace almost entirely unprotected. Over 760,000 square kilometers (40% of Iran’s territorial surface), including Iran’s second most populated city Mashhad, completely lack AAD. One MIM-23 Hawk provides weak PAD for TAB 14 (Mashhad International Airport) and an BM launch complex near Mashhad. 30. The AD strategy for the East relies on alternative tactics. Early-warning and over-the-horizon radars (e.g. 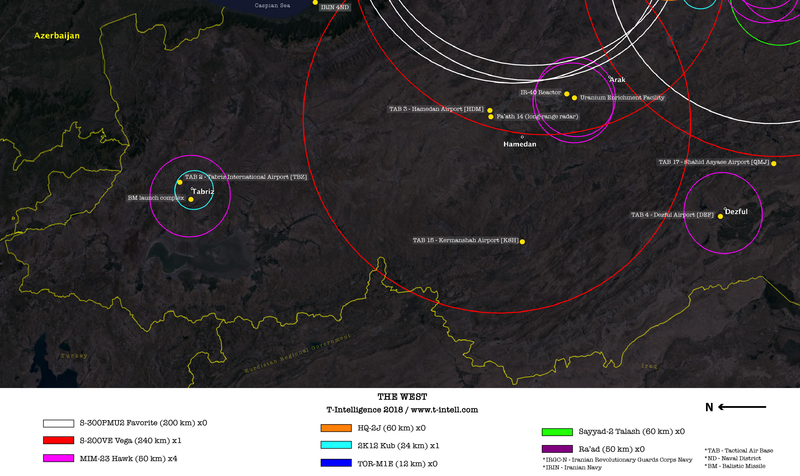 the Nazir radar with a 800 km coverage) detect and identify targets. Threat interception is carried out by outdated fixed-wing aircraft armed with air-to-air missiles, which are permanently held at high readiness. The AD strategy for the East also incorporates the use of electronic warfare (EW) assets. Iran’s EW has proven to be moderately efficient against U.S. UAVs in the past. 31. We asses the Iran will deploy one or two long-range SAMs in the East at the earliest possible date. 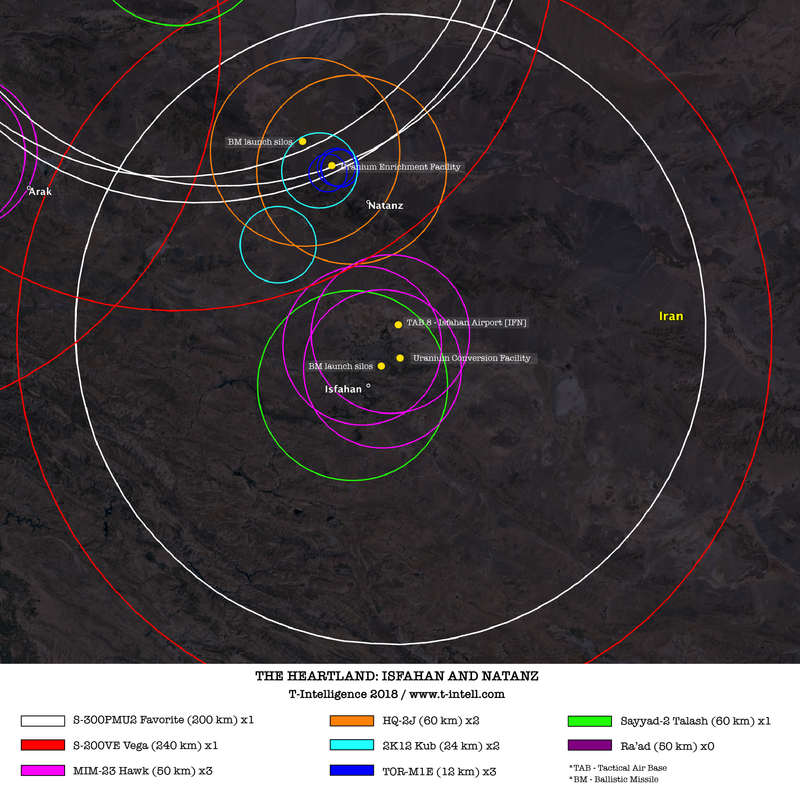 AAD is necessary to mitigate the risk of aircraft penetration and to protect Tehran and the Heartland from attacks with standoff-range low-observable ordinance. The deployment of U.S. F-35s in Kandahar Airbase (Afghanistan) and on amphibious carriers in the Persian/Arabian Gulf mandates Iran to expedite AD enhancements in the region. Our IMINT analysis is based on openly available satellite data (Image Landsat/Copernicus). The Sayyad-2 SAM engagement range varies between 60 and 76 km, depending on missile type. IMINT can potentially confuse the MIM-23 Hawk with the Mersad, Iran’s domestic copy-cat. Mersad’s Shlamche and Shahin SAMs have a 5-10 km shorter range than the MIM-23. An improved variant has a claimed range of 56 km. The engagement range of all pink color-coded AD rings can therefore vary from 40 to 56 km. 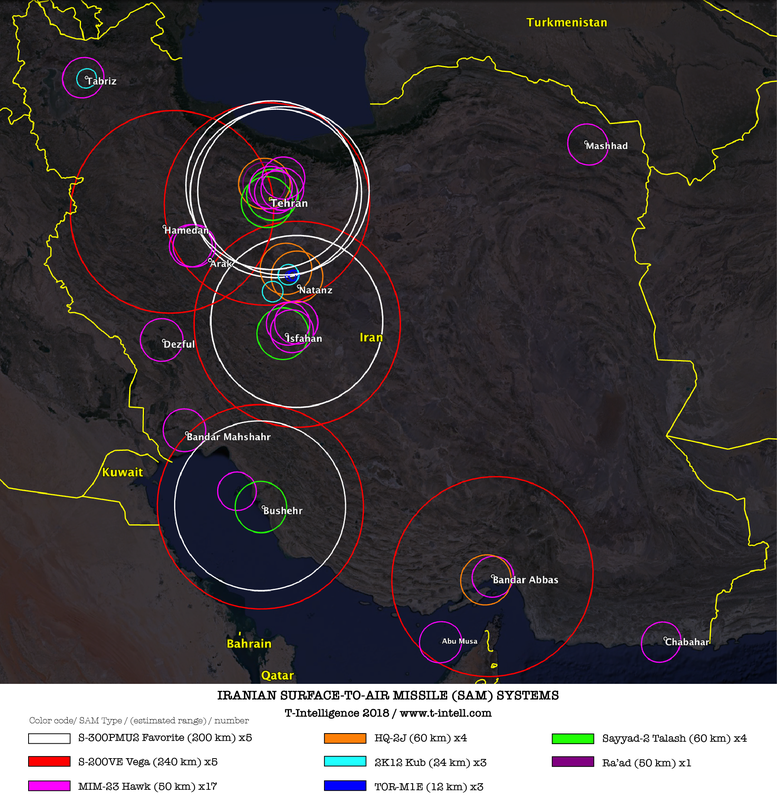 Previous assessments on Iranian SAM deployments have been conducted by Sean O’Connor in 2010 and Iran-GEOINT blog in 2017.